After being hit with 171 lawsuits from non-practicing intellectual property owning entities in the last five years, Apple has further solidified its place as the No. 1 target for so-called patent "trolls." The latest data from the group PatentFreedom reveals that Apple faces another 24 patent suits that were filed through June 30 of this year. With more than 170 lawsuits filed since 2009, Apple is well ahead of second-place target Hewlett-Packard, which has seen 137 complaints. Apple has increasingly become the most popular target for intellectual property complaints. Data from PatentFreedom detailed by AppleInsider in March found that Apple and HP were separated by 22 complaints. That number has since grown to 34. Coming in third in the latest data is Apple's rival Samsung, facing 133 suits over the last five years. AT&T took fourth in the poll, with 127 complaints  30 of those filed in 2013 alone. Rounding out the top ten, in order, were Dell (122 lawsuits), Sony (110), HTC (106), Verizon (105), LG (104), and Google (103). Apple has been the No. 1 target of patent "trolls" for some time, but the distance between it and other companies has been widening. The latest figures show that Apple has separated from the pack with regard to intellectual property lawsuits, becoming the top target for non-practicing entities. 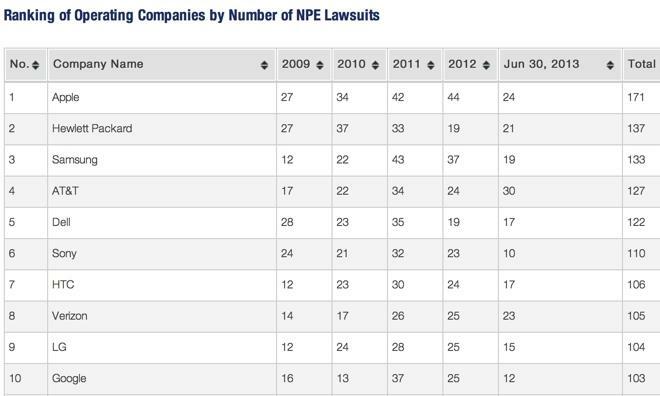 Through 2011, both Apple and Hewlett-Packard were tied in first place with 131 lawsuits filed since 2007. "Patent trolls," as they're commonly known on the Internet, are referred to by PatentFreedom as "NPEs." The group feels the term "troll" is "unhelpful," as it is frequently used to refer to individuals or corporate entities who wish to enforce their patent rights. PatentFreedom, however, draws a distinction by defining certain groups as "non-practicing entities." To them, an NPE is "any entity that earns or plans to earn the majority of its revenue from the licensing or enforcement of its intellectual property." As Apple faces more intellectual property lawsuits than any other company, its former patent chief recently left his position earlier this year. Apple Chief Executive Tim Cook spoke with members of the U.S. Senate about patent issues during a testimony in May. But the CEO spoke of his own interest in strengthening companies' abilities to protect their own intellectual property, rather than warding off lawsuits from non-practicing entities.